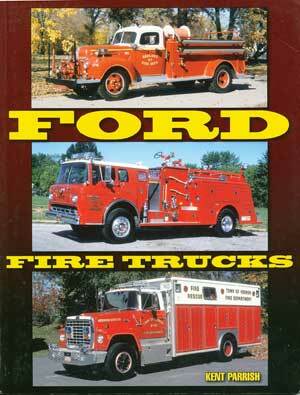 Ford Fire Trucks by Kent Parrish is a wide ranging collection with tremendous captioned info with each photo. And there are a lot of photos, over 400, most in color but some in black and white. Ranging from 1917 Model T’s that were custom built into fire engines all the way to 2009, the book is broken up into ten chapters, roughly one for each decade. I had no idea there were so many companies taking the medium and heavy duty trucks (including COE and C series) and custom building cabs and equipment for fire fighting. If you purchased the Ford Medium Duty or Ford Heavy Duty Trucks books, then Ford Fire Trucks is a great companion. Over 140 pages, $34.95 plus s&h.